Latvian foreign minister, Edgars Rinkevics, who recently came out on twitter. Wikimedia commons. Public domain. 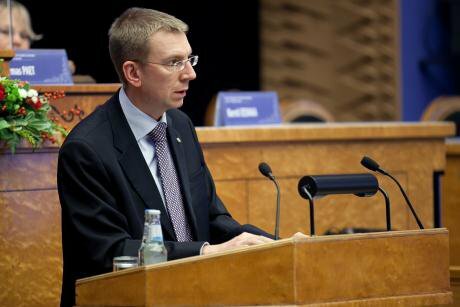 Edgars Rinkevics, Latvian Foreign Minister, decided to announce he is "proud to be gay" on Twitter on Thursday night. He did not feel the need to support his claim as did Tim Cook, CEO of Apple, by arguing that being gay makes you more sensitive to minorities or more perseverant. Inevitably for some the question is posed: What is there to be proud of? Being gay is not an accomplishment. In fact, many people would claim that all people should be equally proud of their sexual nature or, better yet, equally indifferent. Although appearing egalitarian, such a view in response to “gay and proud” claims is one of the facets of what modern social psychology calls "modern prejudice". Modern prejudice has arisen because classic, old-fashioned, blatant prejudice has somewhat subsided, being considered improper and socially undesirable. Cognitive, emotional and behavioral predisposition against disadvantaged groups such as blacks, women, immigrants, and, of course, LGBT people now implicitly takes the form of constantly antagonizing the demands of these groups, denying the existence of discrimination, believing there is excessive attention to their needs, and rejecting efforts to change the status quo. Modern prejudice has also been associated with the conservative thesis that people who work hard enough are eventually rewarded. Under this perspective, no one should be entitled to anything that they have not worked for. Pride should be conquered and never awarded on the basis of something that people simply are, let alone on the basis of their sexual nature. Identity itself might not be reason enough for pride, but it is reason enough for discrimination. What is more, discrimination circumvents hard work. Members of disadvantaged groups are constantly the recipients of lower pay for the same type and quality of work, revealing that there is much ground to be covered before social groups are on equal footing. Treating these groups entirely in the same, equal manner serves only to propagate the status quo. Aristotle argued that there is nothing more unjust than treating unequals equally. If we want to battle discrimination, we should treat disadvantaged groups favorably instead. We should pay more attention to their rights and attempt to cater to their needs. Before we proceed with affirmative action and strategies to ensure that disadvantaged groups are given the chance to cover lost ground, we should initially direct attention to changing our attitudes. LGBT individuals have long suffered the social stigma that goes along with their sexual preferences. Apart from apparent discrimination, they have had to struggle, first and foremost, with loss of self-esteem. A fundamental task of society is, therefore, to encourage positive attitudes that deal with this loss. Declaring “gay and proud” is a statement that is directed exactly against the burden of social stigma. It is a statement that fights for the acknowledgement that the lives and personalities of gays have innate value. Society should embrace these statements on the basis that it embraces the value of life itself. Tim Cook still felt the need to back up his claim of being proud. He said his sexual identity has helped him understand and value minorities and that it made him stronger in the face of adversity. This does not mean that a gay man should accept his identity in the same way or that he should be as accomplished as Tim Cook in order to do so. Gay men, as all people, should be proud, if for no other reason, of simply being alive and part of the community. This is what Edgars Rinkevics probably needed to convey through the simplicity of his announcement. Heterosexuals, on the other hand, find it difficult to understand why a gay man might feel the need to make any declaration of pride with regard to his sexual identity, partly because they have never experienced this sort of discrimination. The latter fact further serves as evidence that LGBT people have still much ground to cover in order to maintain the basic level of self-esteem that all people are entitled to by simply being themselves. This “self-esteem gap” between LGBTs and heterosexuals should be addressed by granting LGBTs the privilege of declaring proud of who they are. All gay people should therefore declare proud of their identity, even if heterosexual people do not. Through the simple acknowledgment that LGBT individuals should be happy and forthcoming with who they are, we can hope that some day all people will be equally proud of their sexual identity. Or equally indifferent.